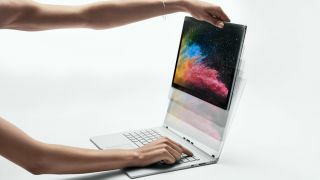 In revealing the Surface Book 2 to a group of journalists in mid-October in New York City, Microsoft devices lead Panos Panay focused much of the unveiling on the superiority of its new 2-in-1 laptop’s touch display. Admittedly, and not to discredit Panay’s passion or dedication, but we heard many of these words in the same way we hear Apple CEO Tim Cook say that whatever iPhone he’s currently pushing is the best iPhone yet. Of course, it is. Of course, Microsoft has crafted the best Surface Book display to date. But, when you speak with someone like Stevie Bathiche, a Technical Fellow at Microsoft working on its hardware design, you begin to understand just how much engineering work and ingenuity goes into making such a claim. In fact, Microsoft designs its displays right down to the pixels – well, almost. With this level of attention to detail, and penchant for mathematical beauty, it makes you wonder what specifically goes into this process. After all, it’s not as if Microsoft is manufacturing displays in-house. But, for what goes into said process, it’s about the only step Microsoft doesn’t take. "This is why … we don’t source our displays: we actually design the electronics that drive the display itself." In short, Microsoft essentially designs the display soup to nuts. So, where does the manufacturing partner come into play? “[For] the most part, of course our partners are also experts in this area. But, the thing we’ve found is that there [are] so many variables when you’re making a display that you need to tune to make those trade-offs in performance and power consumption, and cost and yield, that a partner can’t do that on their own and make the right trade-offs for Surface,” Bathiche admits. Essentially, right up to when it hits the assembly line, Microsoft’s teams of technical fellows and engineers have their hands in the process up to their elbows. We’re told that this level of dedication, not to mention input from Microsoft’s legal department, leads to these designs becoming the company’s intellectual property (IP). In fact, the team up in Redmond, Washington developed IP for its very own processor in designing the displays for its Surface line of products. It’s what is known as a TCON chip, or timing controller. No, Microsoft isn’t about to compete with Intel anytime soon. Consider this piece of silicon a coprocessor that controls a very specific function of Microsoft’s displays: the behavior of the pixels as they’re interacted with. This last piece is perhaps the most intriguing trait of Microsoft’s TCON processor, as Bathiche demonstrated for us during our conversation at the event. All it took was for Bathiche to scribble on a Sticky Note and run the Surface Pen off of the note window, making gray traces of ink appear on the desktop wallpaper behind it that almost immediately disappeared. "Think of us as a fabless maker – that just designs the silicon." That’s the TCON rendering the ink before even Windows 10 does. But, there’s another piece to this puzzle, and that’s the ASIC, or Application-Specific Integrated Circuit, that Microsoft also designed specifically for its displays. But, if digital ink on Surface products is rendered before the OS even recognizes it – 50 milliseconds worth of inking data before erasing as the OS catches up, we’re told – what about custom fonts and colors that could only be triggered through the OS? Naturally, Microsoft has thought of this. If you’ve ever wondered how Microsoft stands so strongly behind such a lofty claim that drawing or writing on a Surface product with a Surface Pen feels like doing so on paper, it’s because the firm designed not one, but two pieces of silicon to get to that point. And, this is just the beginning. During our conversation, Bathiche detailed even more pieces of its displays that are designed in-house, like the LCD module that determines screen thinness (less than 10mm, in the Surface Book 2’s case) and the self-adaptive refresh rate that debuted on the Surface Pro 4, changing the screen’s refresh rate depending on when and how it’s being used. After chatting with Bathiche about just one end of Microsoft’s design and development work that goes into the final product, in this case the Surface Book 2, the company’s level of investment in creating its own hardware is clear: it’s massive. In conceiving and refining the Surface line since before 2012, Microsoft has come to the same realization that Google did more recently and that Apple did decades before the both of them: if you want something done right, you have to do it yourself. Well, that and find friends you can trust.